I got a chance to talk with Peter LaMotte of Washington, DC based startup GeniusRocket this past March right after the much debated "Is Spec Work Is Evil?" panel session at SXSW Interactive in Austin, Texas. We discussed GeniusRocket's mission and take on crowdsourcing. GeniusRocket also has an interesting crowdsourcing story about the creative video that SXSW used this year which Peter will also share. This video interview with Peter LaMotte got lost in the SOMEWHAT FRANK video queue but I just found it and wanted to share the video as episode 76 on SOMEWHAT FRANK. I hope you enjoy our pre-coffee talk at the Crepery in Austin, Texas about crowdsourcing. CrowdSpring Co-founder Ross Kimbarovsky Interview from Frank Gruber on Vimeo. I recently visited Chicago and got a chance to visit the office of CrowdSpring a crowdsourcing design marketplace startup I reviewed previously and put to the test for a logo redesign. I got a chance to chat with CrowdSpring co-founder Ross Kimbarovsky (the other co-founder is Mike Samson) as he explains their progress and even hints at upcoming features in episode 58 on SOMEWHAT FRANK (above). Rather than go with a number of stickers on your laptop which has become very popular with the Web 2.0 movement, you might want to check out a site called Infectious. Infectious offers community designed adhesive art for your laptop, wall or car. Infectious offers artists an outlet for creativity very similar to Threadless, the t-shirt design community hub and JPG Magazine the user-generated photography magazine. Infectious enables artists to submit artwork and the community then votes on the artwork they like the best. The winners are then turned into Infectious designs to be sold in the online store. Pricing start at $24 for laptop art, $79 for wall art and $329 for car art. Check out some of the artwork and personalize your possessions today. You may notice something looks a little different on SOMEWHAT FRANK these days. I decided after over three years of designing my own logos to have the design community take a shot at it. I had an idea of what I really wanted so I was just looking for a logo to be used with an photograph header taken by Washington, D.C. photographer Dakota Fine. If you are like me, you probably want to see a lot of design options and then pick the design you like the best. This is exactly what Chicago-based startup CrowdSpring offers by creating a crowdsourcing design marketplace. I first reviewed CrowdSpring when they launched back in May and showed off at TECH cocktail Chicago 8. In this article I want to share my CrowdSpring experience as I launched a new SOMEWHAT FRANK design based on a logo design (in the up left corner of the site) received using the design community site. 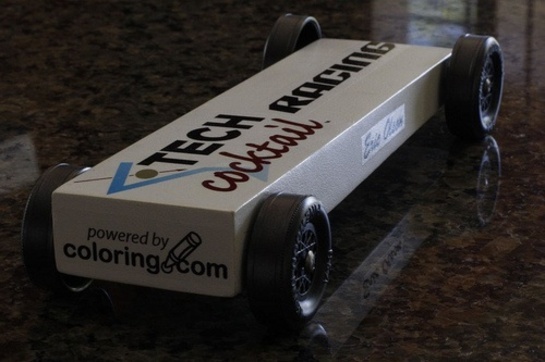 Photo of the Week: This is a photo of the TECH cocktail RACING Pine Wood Derby car which took 6th place out of 41 at this years Threadless.com Threadle Manss this past weekend. If you are looking to have a new logo, business card, graphic or web site designed you know it is sometimes tough to decide where to get started. crowdSPRING, a Chicago-based crowd sourcing startup, might be a good option as it offers a marketplace for your design projects. Simply create a project and the design community will offer up suggested proposals. You can select the one you like the best and pay the designer a one time fee for the design you decide to choose. Everyday just about everyone asks the same few questions as they prepare for another day. What is the weather like outside? And, what should I wear? Now thanks to crowd-sourcing and the power of the Web you can get some help with these questions. Cumul.us is a web site that aggregates the opinions of the masses to display weather predictions and what people are going to wear as a result. Brilliant! You might want to categorize this one under mindless fun online. Paird is an online dating site that enables you to take part in matchmaking by simply visiting the site and matching men to women or women to men. Though mindless fun, you might be actually helping someone get hooked up with a date online. As a Paird user, if you are "paired" up with someone else online you get a chance to thumbs up or thumbs down the pairing.